These cheerful deer will brighten up the winter of anyone lucky enough to receive a card from you! Each card features a pair of deer, a stag and an elk, both decorated with festive flowers and holly sprigs. 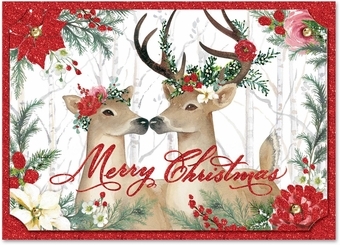 More poinsettia, pine, and berries surround the woodland creatures, with the message of Merry Christmas. Red glitter and sparkly gems add the final touch!